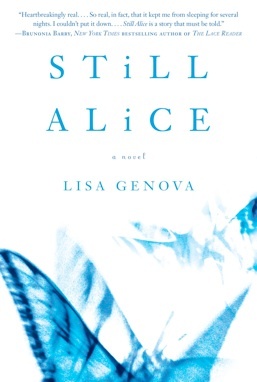 Alice is a fit and healthy fifty year-old Harvard professor when she is diagnosed with early-onset Alzheimer’s disease. Still Alice is a first hand account of someone diagnosed with this disease far too young, and like any first hand account it educates us about perspectives. Smart and instantly likeable, as Alice goes through the stages of her disease so does the reader. Her loss of lucidity is evident as you are treated to the inner workings of her mind. As Alice says in a lecture at an Alzheimer’s convention in one scene, just because they are living with this disease doesn’t mean the rest of the world should write them off. And so this book is not only a great read, a personal journey of a beautiful character and her family, it also educates us about a terribly shattering dementia. I love learning as I read, it’s my favorite form of multi-tasking. Life is no fairytale, and if diagnosed with this disease, it would be almost impossible to see any light. Yet the author manages to bring a touch of grace to a tragic situation. Relationships can evolve in curious ways, as happens to Alice. Without sugar-coating, this story illuminates that Alzheimer’s is not an ending, but rather a challenge which forces you to live your life differently. In her first novel, incidentally written at Starbucks while her child was at school, Lisa Genova has created a touching story about a woman who endures this hurdle with dignity. She fights to hold on to the person she is, and lives in the moment as best she can. I couldn’t put this book down, and when I did I was in a hurry to get back to it. The best books leave us with lessons learned in life, albeit through someone else’s experience. From Alice we learn to persevere, to enjoy the good, and to love hard. And of course that lesson that never gets old – to live in the moment and for the moment. Wow. Sounds like a moving book! My dad works with dementia patients everyday, and it is wonderful to have a book that speaks to their experience when they sometimes can’t explain it for themselves! Thanks for sharing, Deanna! It’s interesting that she wrote it from Alice’s own perspective. Although it worries me that I also have dementia. Thanks so much for this fabulous review. I absolutely must read this book. I’d heard about it, but never taken the time to read it. Obviously, books about the mind fascinate me. Both the perspective and the stigma attached to the disease are well represented – a great book. I have friends who have dealt with parents with Alzheimer’s…frankly, it scares the hell out of me! My father has lived with me for 13 years, and I hope I never have to deal with that. Yes, it’s a heartbreaking affliction.